Here's yet another new recipe as part of Cookbook Exploitation Month. This delicious soup is surprisingly filling, although you can tell with just a cursory look at the ingredients that there are hardly any calories at all in this dish. In fact, you can eat this soup until you're blue in the face and you'll never gain weight. And this is one of the key underappreciated secrets of vegan and vegetarian cuisine. Typical veggie recipes are usually so high in fiber and so low in fat that you practically burn more calories chewing and digesting the meals than you get by eating them in the first place. Think about the ramifications of this for a moment: If you structure your diet primarily around meals like this, and make sure to exercise regularly, you will significantly accelerate your efforts to get in better shape. That's why we've decided to practice "part-time vegetarianism" here at Casual Kitchen, although we'll balance things out with a truly energy-dense meal on occasion when we have a really active day ahead of us. I hope you enjoy this delicious and visually stunning soup. It's loaded with fresh produce and antioxidants, and it's laughably cheap and easy to make. What's not to like? 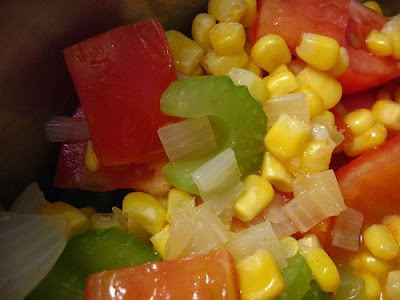 1) Saute onion, celery, cayenne and garlic in oil in a large soup pot until tender (about 5-7 minutes). 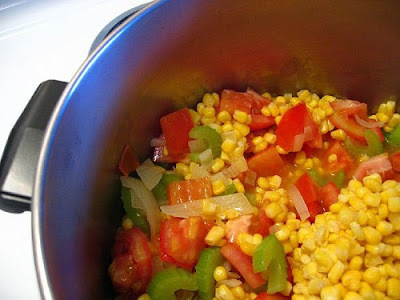 2) Add corn and tomatoes, water and salt, bring to a boil, then reduce heat and simmer for 30 minutes. 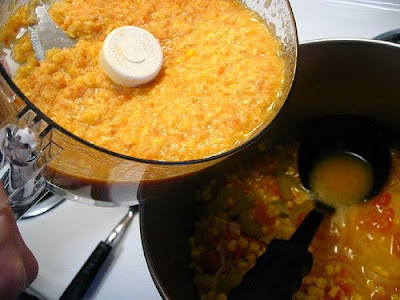 3) After simmering, puree some (or all, optional) of the soup in a food processor or blender for a more creamy texture. 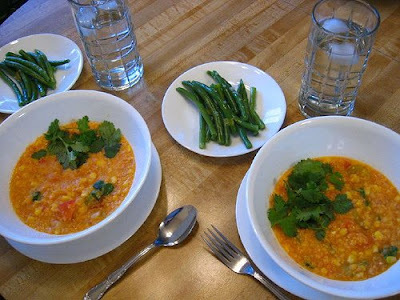 4) Add the cilantro leaves and serve immediately. The original recipe tells you to puree the entire soup. But we found the soup to be better after just pureeing only half to 2/3 of the soup. For one thing, it's logistically easier: since the soup comes in a big batch, you'll find yourself forced to divide the entire recipe up into portions small enough to fit into your food processor or blender, running it multiple times. We found it quite a bit easier to ladle in whatever would fit into the machine, puree it, dump it back into the pot with the remaining unpureed soup, and serve. "The soup is pretty now, but even better if you take your courage in hand and proceed with the next step; puree it all." I know that Laurel's kitchen is a highly "politically correct" cookbook (don't take this the wrong way--it's truly a great cookbook). But with this curiously out-of-place reference to courage, I actually felt like my manhood was threatened here! Of course, then again, maybe I'm reading between the lines a tad too much. Nevertheless, we didn't take the bait and instead settled on a partial puree. I felt like the soup benefitted as a result. Spring for a hand held mixer and you can puree to your hearts content while the soup is still inside the original. Just think of the savings... less dishes to wash, less time spent disassembling a blender, washing than reassembling.... Just a simple rinse is required to clean the mixer.